As the United States election race enters its final lap with President Barack Obama and his challenger Mitt Romney almost tied in latest opinion polls, the two are pinning on the second presidential debate to gain a decisive edge. After an uncharacteristically 'bad night' saw him squander his lead over his Republican rival in their last face off, Obama is prepared to put a more aggressive fight this time to regain his lost ground. "It is going great!" 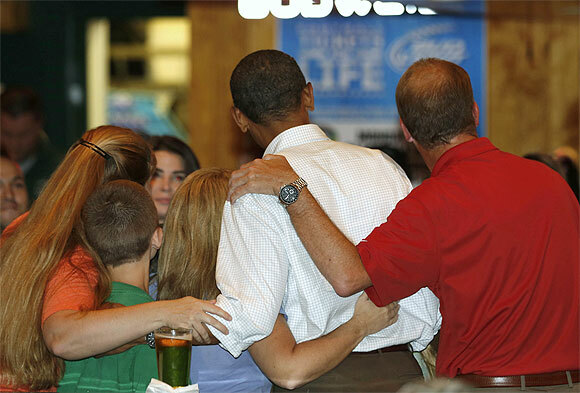 Obama said in Williamsburg, Virginia where he landed on Saturday for his three-day debate preparations. The next verbal dual between the incumbent and his challenger will be fought on Tuesday in New York, with just three weeks to go for the polls. 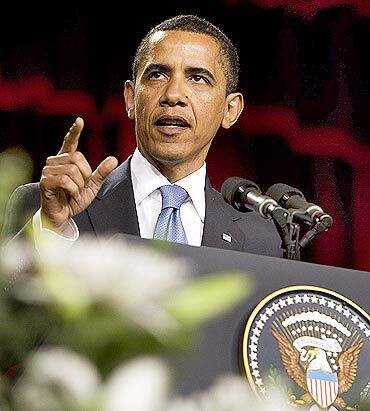 A normally eloquent Obama had a lacklustre outing against Romney during the first debate on October 3, following which the Republican eroded much of his national lead in all the latest opinion polls. 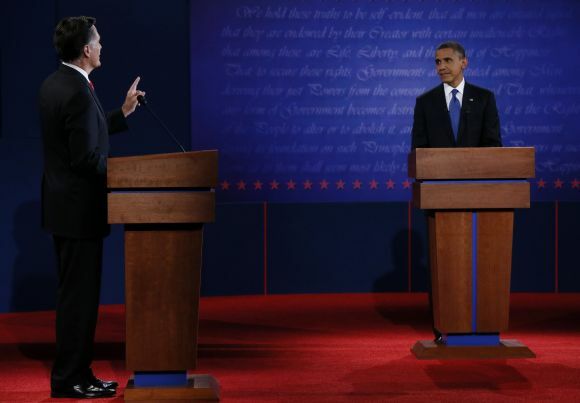 In an interview later, Obama termed the debate as a 'bad night' as his aides said he would be more aggressive this time. "I think he's going to be aggressive in making the case for his view of where we should go as a country," David Axelrod, the Obama Campaign Senior Strategist, told Fox News in an interview. In the upcoming debate, Obama would be very forward looking, said Robert Gibbs, a senior adviser to the Obama Campaign. "I think the president will be very forward-looking, will be very conscious of making sure people understand the choice in this election," he told the CNN. "I think you'll see somebody who is very passionate about the choice that our country faces, and putting that choice in front of voters. Are we going to build this economy from the middle out? Are we going to give people opportunity and make the needed investments to give them that opportunity, or are we going to do this from the top down, the perspective that the Romney campaign brings?" Gibbs said. 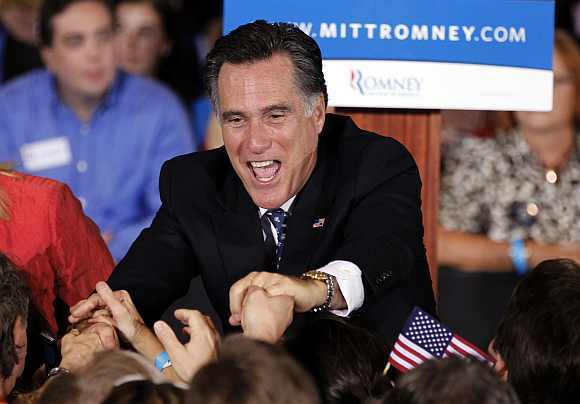 The Romney Campaign shot back by asserting the Republican candidate was ready to meet any challenge. Romney is in Boston preparing for the debate with Senator Rob Portman and longtime aide Peter Flaherty. "The President can change his style. He can change his tactics. He can't change his record," Ed Gillespie, senior adviser to the Romney Campaign, told the CNN. "And he can't change his policies. And that's what this election is about," he added. Gillespie said the Massachusetts Governor will try to repeat his performance of last time and talk about his agenda and contrast his proposed policies with that of Obama's. "That became clear in the first debate. It will be clear in the second debate. It was clear in the vice presidential debate," he said. "This race is tied," Obama told his supporters in an email. Obama is currently preparing for, what is being said, as one of the most important debates of his life. RealClearPolitics, which keeps track of all the major national polls, said Monday that the average of all the major national polls has resulted in a statistical tie between Obama and Romney with each having a support of 47.3 per cent of the voters. "I think it's very, very close," the Obama Campaign spokesperson, Jen Psaki, told reporters in Williamsburg. "There are some states where we're up by a few points and some states where we're down by a few points," she said. "You should expect that he's going to be firm but respectful in correcting the record and the times we expect Mitt Romney will hide from and distort his own policies. He's energized and I expect he will also be making a passionate case," Psaki said. She said the campaign needs everyone to vote and "we need every last dollar" to compete against Romney. Responding to questions on Obama's debate preparedness, she said the President takes every task seriously, whether it's preparing for a debate or discussing the options for helping small businesses or meeting with his national security team.